Our partner schools truly exhibit the mission of Students of Medicine. 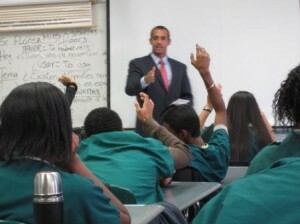 It is through them and their students that we realize our goal of improving the health care of underserved communities. We believe that our pilot programs, such as the one at the Bronx High School of Medical Science, are a sign of the future of education inner city high schools. These environments demand more enriching experiences from their schools to keep students engaged and Our Pre-Med program provides the enriching real-life guidance that these students require to stay on-track. separated from the dangerous and distracting streets outside. Schools serve as safe-havens and and a bridge to a brighter future. Our Pre-Med program provides the enriching real-life guidance that these students require to stay on-track. We provide fun and interactive ways to learn valuable information and skills. We also provide the mentorship to allow the students to see the path before them. We invite you to take a tour of one of our partner school and meet some of the students and staff. This will give you a better of idea of the change we are helping to create.